Devoting a little bit of my time to roam around BGC has become a sort of annual tradition. After the "hunts" I did back in 2015 and 2016, I was looking forward to new murals in the area so I could have this little personal expedition again. It's therapeutic, actually. There's just something about art in public spaces that I love, and as one comment I saw put it, "It really brings color and life to the concrete jungle." I agree. This was one of the things I loved when I lived in the area a few years back. Art is everywhere and there's always something new to see! I was ecstatic when it was announced that there were 6 new murals for everyone to see! And this time around, I decided to join the scheduled walk tours that Arts at BGC offered so I wouldn't miss any of the new artworks. I think these personal graffiti tours I did on my own before somehow helped me to be less geographically challenged (LOL I am the worst with directions), but let's be real here, it's impossible for me to cover all sites especially if there are farther ones. Originally, this wall had this piece by FAILE. I guess they needed a big space for this collaborative work between ASEAN and ROK artists. Some of the artists that participated in the creation of this mural were: Younggyun, Nam, Siyeong, Sunil, Auggie, Bunga, Bows, Haha, Perol, Pesey, Ariff, Cyrus, Zero, Miguel, and Nemo. Nemo Aguila was the only one I was familiar with; you can check out his Instagram account here. 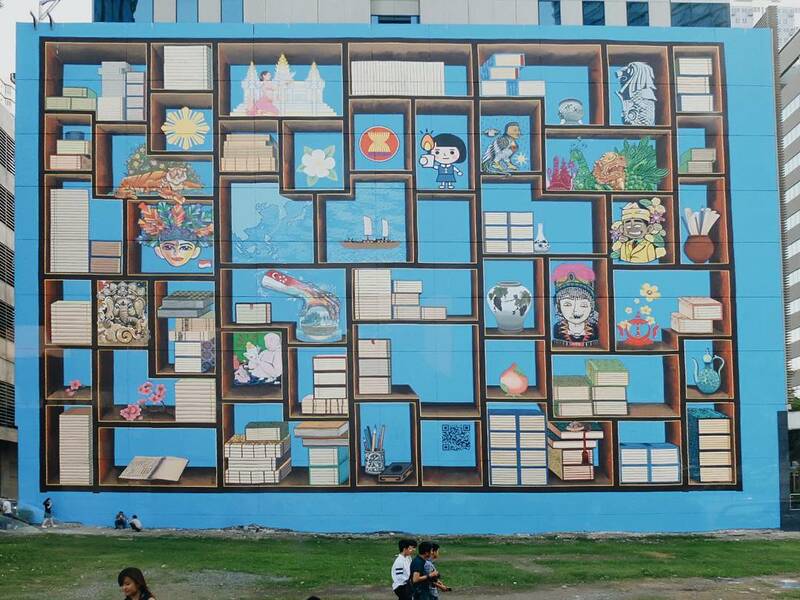 I was looking at Art at BGC's Facebook account (they were doing, I think, once a week reveal of the new works), and was instantly piqued by this because of what looked like a Totoro figure included in the mural. For the People: Gates of Paradise was made by artists Aids Mariñas, Miles Villanueva, Leny Leonor, and Steven Bruce of Palimpsest. It aims to depict that the progress of civilization and technology goes hand in hand with us, the people, and our preservation of nature. And I would like to assume that that's indeed somewhat a homage to Totoro because the artists were inspired with films like Howl's Moving Castle, Wall-E and Snowpiercer. This three-panel artwork by Solana Perez, which is her ode to her hometown, Baguio City, rooted from feelings of homesickness and longing to return to her childhood home. You can see the beautiful combination of bright colors and references to mountains and horses. Jerson Samson's inspiration was actually urbanization and overpopulation, hence the concept of building tree houses on top of as a way to create or reclaim some sort of feeling of home and personal space in this busy and overcrowded city. Another inspiration were mushrooms and their ability to sprout in unexpected places. Take a peep on each of the 11 tree houses and see the details in each. Before the malls and coffee shops were the norm meeting places, in the old days, tagpuan has that romantic connotation of places where you meet lover in secret. I loved how this was made, the man painted on one side, the woman on the other, meeting at the center, which is a lamppost. ANG GANDA. This is a collaborative effort between John Paul Antido, Raymond Vidal, Antonio Areola, Jr., Shannah Orencio, Pogs Samson, Gab Baez, Red Salonga, and Fiona Helena. Hear No Evil, See No Evil, Speak No Evil by Archie Geotina. This is located just under the Dating Tagpuan mural. That's it! If you have spare time to just stroll around the city or you need a new route when doing your morning or evening runs, this would be perfect for you! I just love how BGC makes art accessible for everyone and I do hope next year they would feature more graffiti artists (especially those I'm a fan of hehe)!